This year I had two sewing resolutions (and I use the term resolutions loosely). One was to experiment more with sewing knits. The other was to try using a double needle. It turns out that neither one was as difficult or intimidating as I had imagined. Both the Skater Dress and the Oliver + S School Bus T-shirt were great beginner patterns. This gave me the confidence I needed to try something I've wanted to make for a long time: swimming suits. I was looking around for patterns when Suz of Sewpony emailed asking if I'd like to try her new pattern, the Cosi swimsuit. I loved her pattern from the moment I saw it. She asked if I wanted to be part of her pattern tour this summer. 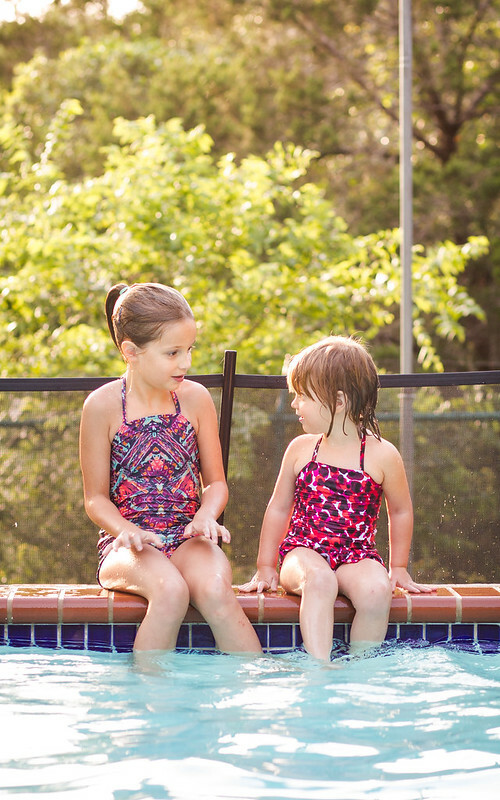 Not only did I stop searching for an alternative pattern, but I also coaxed my girls into wearing last year's swimming suits until the pattern was ready. It was so worth the wait. I really love this pattern! The swimsuit is stylish, yet provides really great coverage. I was pretty discouraged by the swimsuit selection at places like Target this year. Many of the suits were just not age-appropriate, in my opinion. Call me prudish, but I'd like my girls' swimwear to have an innocence about it. The store-bought options often looked as though they were designed for teenage or college girls, not little ones. The pattern has seven different options to chose from. For Indigo's, I picked View C, except I left off the leg frills. There were a couple of things I learned along the way. First, Suz has a chart in the pattern that tells you which pages to turn to based on the option you are making. That was so helpful. Kristin blogged her Cosi swimming suit and mentioned leaving the front of the gusset unsewn/unattached for a cleaner finish. This was brilliant! I tried it when sewing Iris' suit. There really is no need to sew the front of the gusset down and like Kristin pointed out, many store-bought swimming suits (and I noticed underwear, too) don't have it stitched down. I noticed on Kristin's photos that she also knotted the ends of the straps to finish them. I loved that. Another thing I found helpful was to baste the elastic to the swimming suit (rather than pin it) using a long, straight basting stitch. It made it so much easier to turn the hem down with the elastic already stitched in place. And don't fear the double needle. It's so easy to use and gives such a beautiful and professional finish. It's really as easy as changing needles and threading an extra bobbin. Then just place the extra bobbin on top of your topstitching thread, thread both needles and you're good to go. For Iris' suit, I made View D with the little peplum. I cut the peplum a little less wide than the pattern piece. I measured Iris and decided on sewing the size 2 width based on her chest measurement and size 3 length. This fit perfectly. Iris loved the little peplum so much. When she got in the pool she exclaimed, "Yook, Mama, I flying!" I love this age when toddlers really get talking yet don't quite grasp English grammar or sentence structure well. One of our favorite family stories is when I dropped Dan and the three older kids off at the grocery store while Iris and I waited in the car. Iris reached out her hands and sobbed, "Daaaa!!! Kids!!! Meee beeee!". Anytime Dan goes on an errand, Iris asks, "Me go you?" And my personal favorite is when Iris reaches up and says "I hold ewe". Oh and Ms Tarikua is definitely not going to be left out of the mama-made swimsuit party. I actually plan to make three more of these suits, two of which will be for Tia. But I wanted to deviate from the pattern a bit, at least on one of them, so I wanted to try the pattern straight-up first. :) This pattern is not only empowering, but also highly addictive! I recommend it! Awesome!!! I actually signed the kids up for swim classes this summer, and was seriously considering making them both suits. Or maybe just Maggie. I did briefly consider myself too, but hello, I've never sewn even ONE swim suit, and I prefer full coverage/grandma rash guard AND skirt so seriously, probably should just go to Lands End and fork out the cash! These are AWESOME! I love that you are sewing all kinds of knits now! So fun! These are so pretty! I agree with you about preferring little girls swim suits to look a bit innocent, and I love the fabrics you've chosen. It's midwinter here, but I'll definitely be giving this pattern I try when we head in to spring. Thanks, Suzy. I think you will love the pattern! I love them Rachel! Beautiful fabrics and the fit is perfect:) I am so glad you are enjoying my pattern . Thank you!! The are really cute (in particular the peplum one), but I am still afraid of this kind of fabric. I guess you wouldn't like Poopoopidou, the swimming pattern of Papillon et Mandarine, a french pattern designer (not quite sure this is the correct word, sorry) : http://www.papillonetmandarine.bigcartel.com/product/patron-poopoopidoo . I must say little girls here love it, my daughter Jeanne keep asking for it. Can you believe I chose the exact same views for my daughters?! View C with no frills for Teresa and view D with the little peplum for Ines. Suz has definitely put together a great pattern! Wow, look at you, double needle one day and swimsuits the next! The swimmers are wonderful and the girls look gorgeous. I'll be following in your footsteps when summer comes around. And don't worry, I'm a fuddy duddy too about bathing suits for my kids. One piece bathing suits all the way. Although O asked me the other day "how come you get to wear a two piece bathing suits and I don't?!" God help me. Is this what the teenage years will be like. If so, I totally deserve it. My mom and I fought over what I wore for years! Good times. Love your suits! and the fabrics! fantastic! And, as always adorable photos! I especially love Indigo's suit! Swimsuit shopping is so tricky for girls! I also prefer the one piece or longer tankinis. Mallory actually has to wear a 2 piece bc of her insulin pump...but trying to find a 2 piece that is age appropriate for a 5 yr old is much harder than it should be. Wish I could sew.... Or find the determination to learn! Love them both! 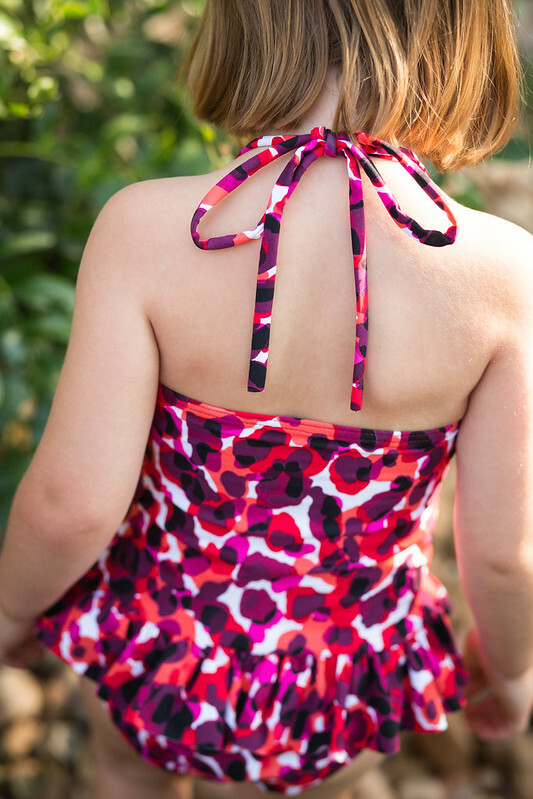 My girl only wears one piece bathing suit (much more practical and appropriate for younger girls). I'm about to start the peplum version for my girl (it's so cute) and I'm guessing the basting tip will be very useful around here (my first attempt with a swimsuit). Congrats on successfully tackling a sewing resolution and achieving such fabulous results! 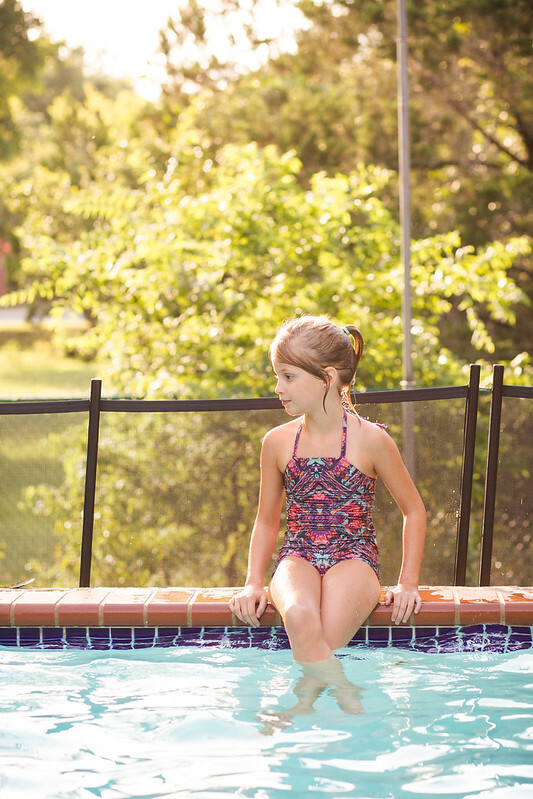 I have yet to make a swimsuit, though I think about doing so every spring when I browse through the kids clothing catalogs and gulp at the high prices. 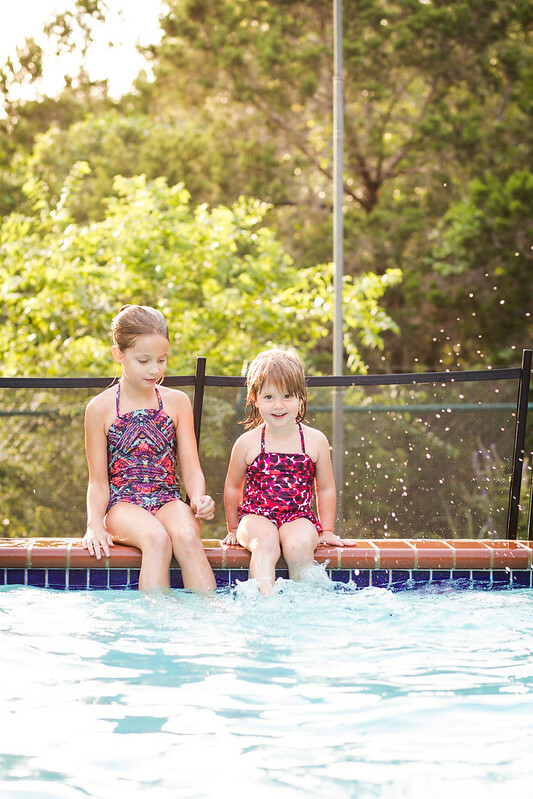 Love the swimsuit fabric you chose - did you buy it on-line? Thanks so much, Lucinda! And I did buy the fabric online. I meant to post about that, but this post got so long I thought I'd save it for next time. I ordered the fabric for these suits from Fabric Fairy and I also ordered swimsuit fabric from Michael Levine. I can't attest to how it will hold up yet, but I was really happy with both so far and the Michael Levine fabric (suits coming soon) felt particularly luxurious! Wow, impressed again! These both came out beautifully. Oh I love the shortened peplum, will be making that version for sure. These are beautiful!! Awesome, they were so beautiful ! They look pretty on their swimsuits, I like the fabrics and the designs too. Check out on our page for more swimsuits designs for girls too - Swimsuits Direct - Girls !